that was a basic effect basically having me draw the effect frame by frame. It works but its limited. Nice look to the flame. I think your thumb needs a new flint though. 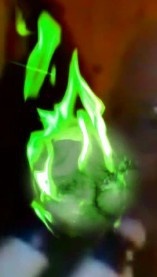 LOL thanks, the flame is actual video footage of a torch, but with everything but the fire removed, pretty cool stuff I downloaded a huge pack of prekeyed effects like that. I then tinted it green and manipulated it to fit around the green difuse ball I added. I used motion tracking keyed to the black electrical tape on my fingers to control where the ball and the flame moved during the video.... its freaking cool. I think I might try to see if I can animate the fractal overlay I put in the bal to see if I can make it a little more alive. my next project is to see if I can toss the ball from hand to hand, create a believable magic projectile, and a flaming knife. Thanks for the details. Special effects have interested me since I saw my first Ray Harryhausen movie. Jason and the Argonauts to be exact.